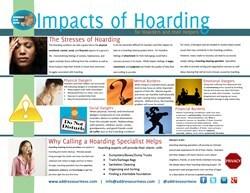 The physical, emotional, mental, social, and financial impacts of hoarding can be detrimental to the health and well-being of a person struggling with the mental condition known as compulsive hoarding. Address Our Mess, an industry leader in the hoarding cleanup industry, has developed a video series geared toward helping hoarders overcome the oppressive impacts of the hoarding condition. Address Our Mess' new video series focuses on the Impacts of Hoarding. A good goal is to have family and friends over for holidays and events. You may not be able to do so with all of these items in your home. tips on how to develop methods to recover. Routine maintenance to the home itself also suffers when a clutter cleanup problem persists. Neglecting to clean and sanitize a home can also lead to compromising the structural integrity of the property. Amenities that make a home functional and sanitary like plumbing, air conditioning units, and hot water heaters are often affected by the hoarding condition. By compromising these appliances, inhabitants of the home can allow diseases to fester and spread while exposing themselves to environmental hazards due to extreme temperatures. Josh states, “You may have the best intentions of cleaning your home up. I’m sure you have purchased a lot of boxes, storage totes, and containers. But the thing of it is, there’s more stuff than just one person can handle.” Address Our Mess hoarding, clutter, and animal hoarding services provide people with professional advice and deep cleaning methods to help facilitate a happier, healthier lifestyle. For more than 22 years, Address Our Mess has provided clutter and hoarding cleanup services in locations across the continental United States. With project managers certified to handle any type of deep cleaning situation, Address Our Mess is equipped to deliver exceptional service while providing keen insight to the hoarding recovery process. To learn more about Address Our Mess, visit http://www.addressourmess.com.